Whole Foods Market is about local, natural, and socially and environmentally responsible commerce. The Whole Foods Detroit city location lives up to these principles not only in what it purveys, or through the associates in the store, but as well with the environment and building in which it conducts its business. This footprint is more condensed and “city right” relative to the square footage, with its natural, yet “downtown” sensibility. Design partners, local artists and fabricators joined with the Whole Foods team to create a fusion of food and place through reclaiming, re-purposing and even re-imagining pieces of Detroit’s past into an expression of Detroit’s future. 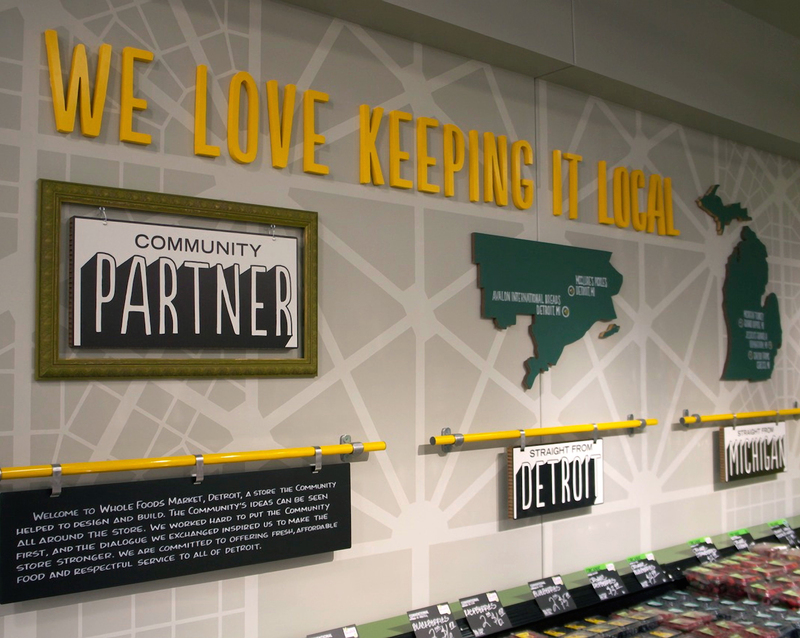 The character of the store creates an instant connection with the shopper in the neighborhood; a neighborhood that represents the past, present and future of urban Detroit and its eclectic, colorful and welcoming message to those looking to contribute to the future of the city.